During a detox diet, you abstain from eating certain foods for a few days, and drink plenty of liquids to help your system flush out harmful toxins. During a cleanse, your body is likely to crave the foods you are denying it, especially if it’s used to regularly ingesting caffeine, sugar and refined white flour. You can curb the desire for these foods whilst detoxing by retraining your body to want other, healthier foods. It can be quite a challenge! That’s why so many people choose to join an in:spa retreat for a week of cleansing as you find yourself in a controlled environment, with a team of experts (including nutritionists) and far away from the temptations of any Starbucks or biscuit tins. But, if you choose to do a detox at home, here are a few helpful tips to keep you on track. Drink fluids: Most detox diets involve drinking plenty of fluids, and this is key for fighting cravings. Most experts agree that the best way to fight to cravings while detoxing is to drink more water or herbal teas. A craving for a certain food (biscuits, for example) means your body is running low on its supply of refined sugar and processed chemicals because they are being flushed out. 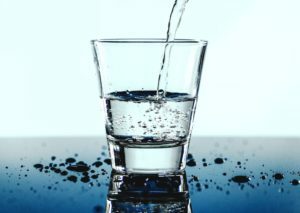 Drinking fluids speeds up that process and helps the body break its addiction. No more addiction means no more craving. Fluids also fill you up quickly, curbing hunger pangs and suppressing cravings. Once you drink your serving of fluids, the craving should dissipate within 10 minutes. Eat something else: When you get an urge to eat something unhealthy, respond by eating something healthy. When you feel the temptation for a slice of chocolate cake, eat a mango. When you crave a packet of crisps, eat some roasted pepper and walnut dip with some fresh, sliced vegetables. 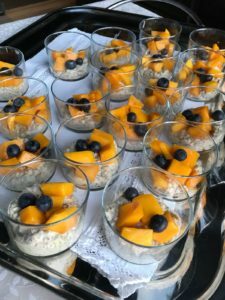 There are tons of detox recipes out there, so scour the internet or try the numerous healthy recipes created by in:spa chefs and nutritionists! The body does need sugar and some sodium to survive, but it does not need them in a processed and unnatural fashion. Eating a healthier alternative will train your body to want something good for it, as opposed to wanting something it’s addicted to. Note: Whatever you’re eating, try to make sure it’s organic because traditional produce may be covered in chemical pesticides. Ingesting those chemicals defeats the whole purpose of your detox. Try yoga: Many people believe that we are more likely to cave in to our cravings when we are tense or stressed out, and yoga can help you relax and stay focused on your goals. Also, detoxing can leave us feeling physically weaker, and simple yoga is a low-impact, slow exercise program that is very appropriate for that physical state. 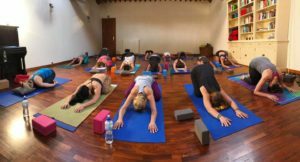 Again, this is another reason why an in:spa retreat is such a good way of ensuring a successful detox as guests benefit from twice daily yoga classes with our outstanding yoga teachers.